Die Stadt Enchuijsen = La ville denchuijsen - GUICCIARDINI, L.
Title : Die Stadt Enchuijsen = La ville denchuijsen. 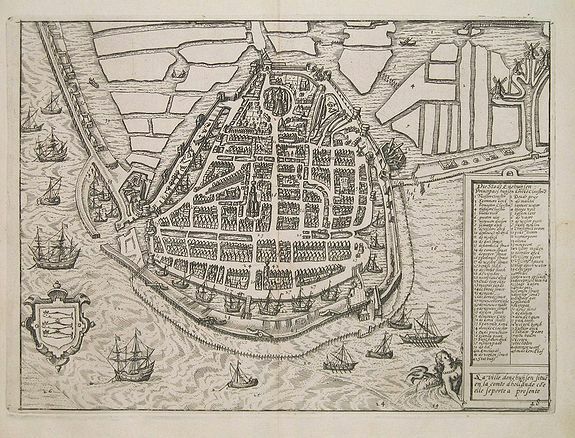 Description :Nice city map of Enkhuizen, engraved in a bird's eye view. West is on top of the view. Extended legenda box with city gates and numerous important buildings. French subtitle in lower right corner. Second state of Guicciardini's "Descrittione" from the french edition, published by Joannes Janssonius. Verso blanc as usual. Condition : In mint condition. Very sharp impression. Vertical center as published.